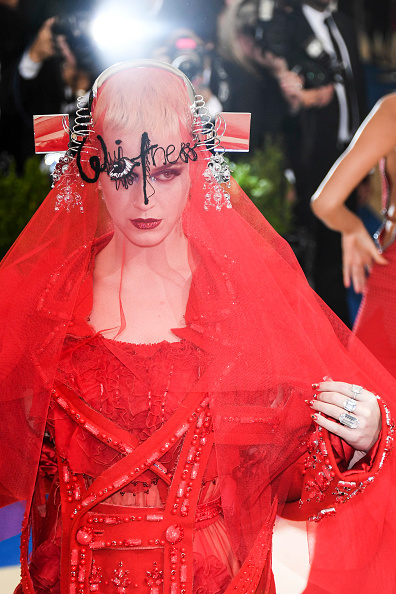 As soon as we saw Katy Perry step out at the 2017 Met Gala, we instantly had flashes of The Handmaid’s Tale. Now, Katy was more likely thinking of honoring designer Rei Kawakubo and Comme des Garçons than she was the Hulu original. But look, we’ve been binging the show, and it’s clearly on our minds. 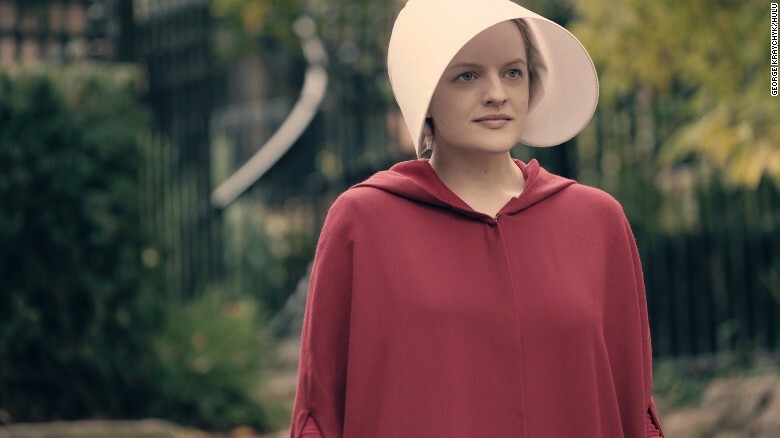 The headgear, the floor-length crimson cape — it’s all very Handmaid’s, no? And her sculptural headpiece has got that “under his eye” vibe. OK, enough of The Handmaid’s Tale allusions. Let’s dive into Katy Perry’s very avant-garde ensemble. It makes perfect sense that she would choose something so on-theme — she is the night’s co-host, after all. And considering she’s always a bold breath of fresh air, sartorially-speaking, she was the perfect choice for this esteemed position. Katy chose a Maison Margiela Couture ensemble, designed by John Galliano. The layered look is a wool coat worn over a tulle gown and punctuated with embellishments galore. Now back to that headpiece — there’s more to discuss here. It’s hard to read, but it looks like it says “Witness” in embroidery, with springs and mirrors affixed to each side of her veil. Always the queen of details, Katy gave her nails the Comme des Garçons touch with eye jewels and 3D gems. The singer is always high-impact when it comes to her Met Gala ensembles. Remember last year when she accessorized her Prada gown with a Tamagotchi pet? 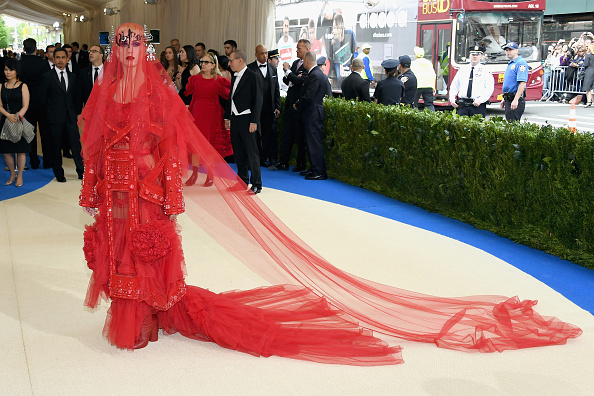 While Katy didn’t wear one of Rei Kawakubo’s designs (although reportedly she’ll be changing into a Comme de Garçons ensemble during the actual event), her red carpet choice is still a beautiful ode to the fearless, boundary-pushing fashion designer. Way to start the night off right, Katy!